Please dont stop the Ranma~! The Episode begins With Ranma Having a Nightmare about kuno wanting to date and be in love with the pig tailed girl. When Ranma and akane go to school they fight through all the classmates together because they are late from bickering with each other on there way to school. 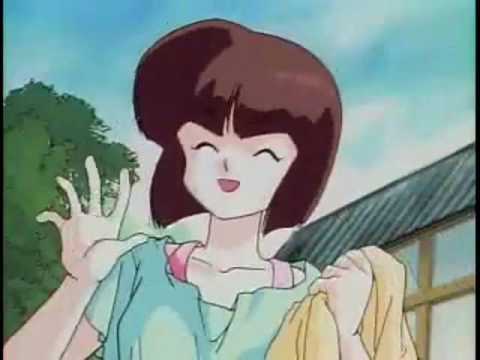 Being that kuno would always talk about akane and the pigtailed girl Nabiki decided she would scheme a way to have fun go out and make money, so she took photos of the pig tailed girl while ranma was sleeping, nabiki also took photos of akane while she was working out. 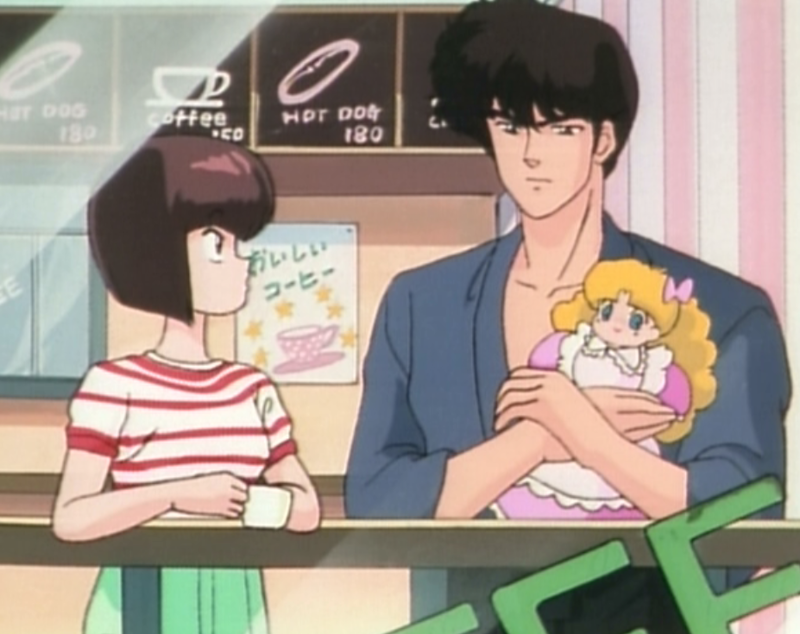 When tatewaki kuno gave nabiki an invitation to meet, Kuno wanted nabiki to give a doll he bought to the pigtailed girl for him, nabiki told kuno that the best way to do that and talk with the pig tailed girl was to goto and talk to ranma. When kuno spoke with ranma then, and told ranma of his love for the pig tailed girl, ranma said that kuno would never see the pigtailed girl again! 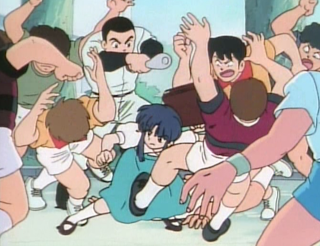 this started a fight and as usual ranma won. 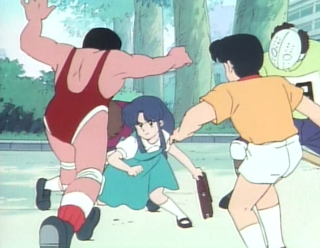 But ranma took some hits as well, because he was distracted during the fight when he found kuno's photos of akane and the pigtailed girl. 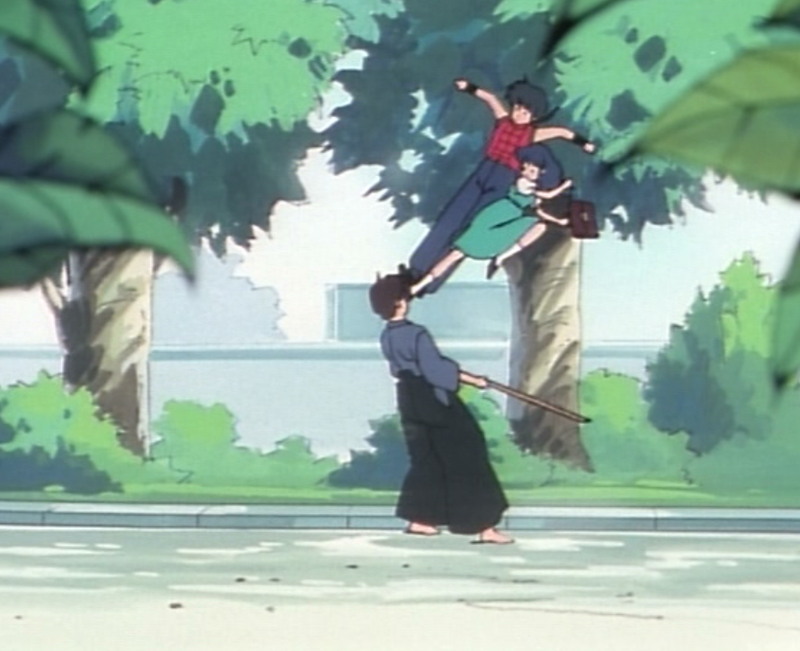 Ranma Episode 3 A Sudden Storm of Love! 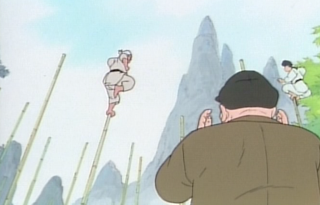 The Episode begins where the other left off Both Ranma and tatewaki Kuno Land in the Pool, but to kuno's suprise in his mind he does not find ranma at all but instead he finds a girl with a ton of martial arts Skills! 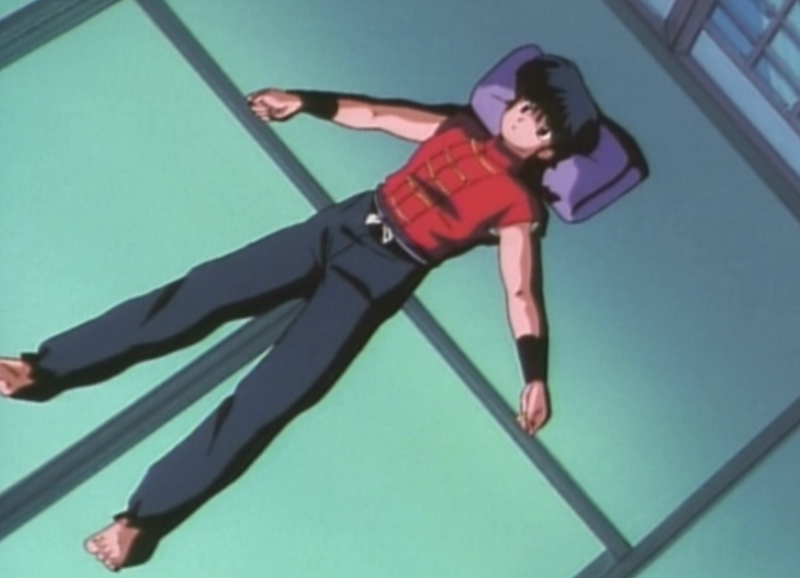 Undetered Kuno Continues the battle and thinks the girl knows where ranma is hiding but to kuno's Suprise the girl Kicks him in the face and he is defeated! 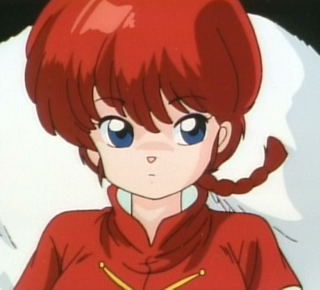 Nabiki tendo finds Kuno as he is confused and searching for answers, she tells kuno that the girl is Ranma's sister and can help Kuno relay messages and keep in contact with the "Pig Tailed Girl". 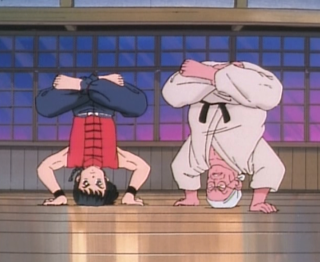 After School ranma and genma discuss the day at school while training their martial arts, Genma Demands that ranma be more cautious about his image at school and also demands that ranma strive to defeat all his rivals such as Kuno and be the best and most noble martial artist at furikan High. After Training Ranma Relaxes and contemplates everything he is dealing with, akane had done alot to protect him that day and he is starting to have some good friendship feelings about her, he lesierly walks over to akanes door to tell her she likes her or somthing, when ranma hears akane telling her sister nabiki that she is Getting driven crazy by the situation and finds ranma and kuno's behaviors at school rather annoying..
Needless to say the Next Day Nabiki handed ranma a Note from Tatewaki Kuno inviting the "Pig tailed Girl" to meet him, ranma thought it was to continue the battle, but to his suprise after school it was so that Kuno could tell the Girl that He Loved her and gave her flowers. Ranma Episode 2 School is No Place For Horsing Around! 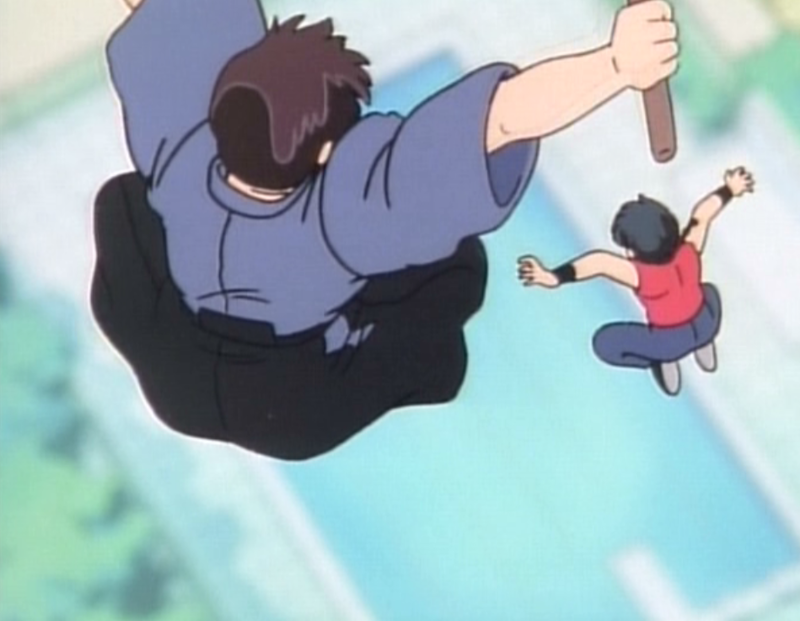 In the Morning the Saotome's had a Squable and practiced fighting before Breakfast, When Ranma left for school during an argument with Akane Ranma had gotten wet, so they stopped by the Tendo Familys doctors office, and ranma met Dr Tofu, who was such a good martial artist that he actually snuck up on ranma and surprised him! Ranma also found out that Akane like Dr. Tofu because he was a man and a well mannered gentlemen. 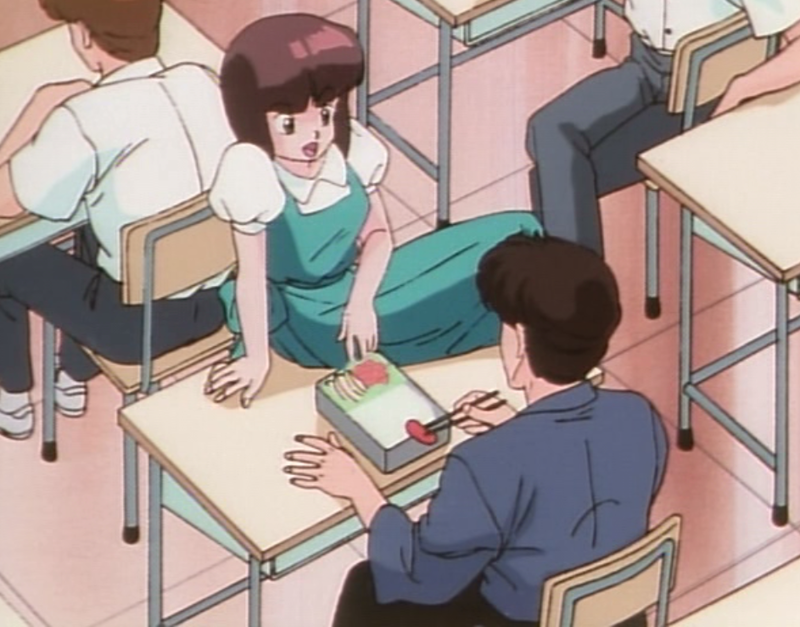 After Ranma returned to being a man and the Tendo's family medicine was picked up Ranma and Akane had continued on their way to school... thats when Ranma found out that all the guys want to be Akane's boy friend and that she felt that they were all immature boys and that she hates them all! So every day at school Akane had to fight off all the guys before class because they had all agreed to themselves that if any one could defeat Akane that they had the claim to be her boy friend. 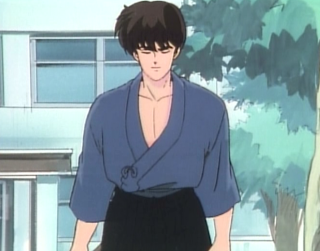 If fighting a Big mob of weakling students was not enough, at the very end Tatewaki Kuno shows up and hes the best martial artist and most renounced classmen at the school, initially he was prepared to fight Akane as usual, then he realized that there was a man standing by Akane and talking to her fairly openly, so he challenged Ranma to a fight, and it ended with cold rain as a draw with both suffering injury from each other. The episode ends after all 3 people, Akane Ranma and Tatewaki Kuno are all standing outside class in the hall for disruptive behaviors and Kuno & Ranma resume their morning fight, looking for a safe place to fight they jump out of a 3rd story window and it is presumed Ranma will Land in a pool of Cold water, what will happen to ranma if the whole school finds out that he can change into a girl? 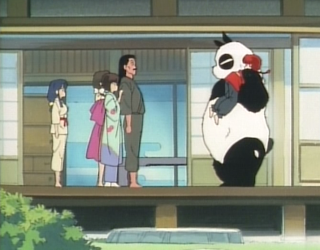 On a Rainy Night at the Tendo Family the Head of the House Hold Soun Tendo recieved a Letter that Ranma and his Father, his Old partner in martial arts MR. Saotome was finaly visiting and that as promised Ranma would be getting married to one of his daughters. 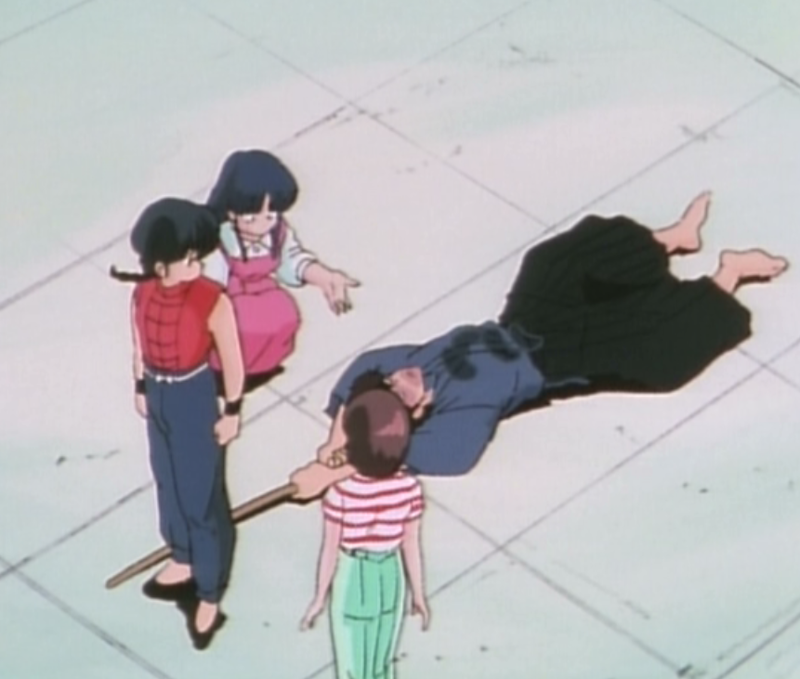 So when the Saotome's arrived and it was confirmed that the girl was indeed Ranma, Soun fainted in disbelief How could a miss like this have happened? After Soun was back awake, and Genma Saotome told soun the story of how it all started when they Journeyed to a legendary training grouns and had fallen into the cursed springs at Jusenkyo China. 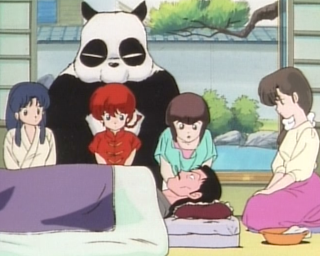 So the 3 Daughters of the Tendo Family early on are perplexed with the fact that ranma is a man after they initially met ranma the woman and liked her and felt they slightly knew her, and that one of them is being set up by their father to marry him.. This AMV is all about Anime's Material Girl, Nabiki Tendo!! Nabiki Tendo is Every Mans Nightmare, she's beautiful shes crafty, shes a SCHEMEing temptress who will do anything to cheat men out of their money or have them spend it on her. She will stop at nothing to get what she wants and she always comes out on top, the only men that interest her are the ones who give her a run for her money in the game.